Tim Dunlop accepts his award. La Trobe alumni Tim Dunlop can’t drive down the Calder Freeway without pointing out its finer details to his children. Working on the freeway upgrade was one of the first projects Tim undertook after graduating from civil engineering in Bendigo. “I drive down there all the time and I’m still proud,” he says. 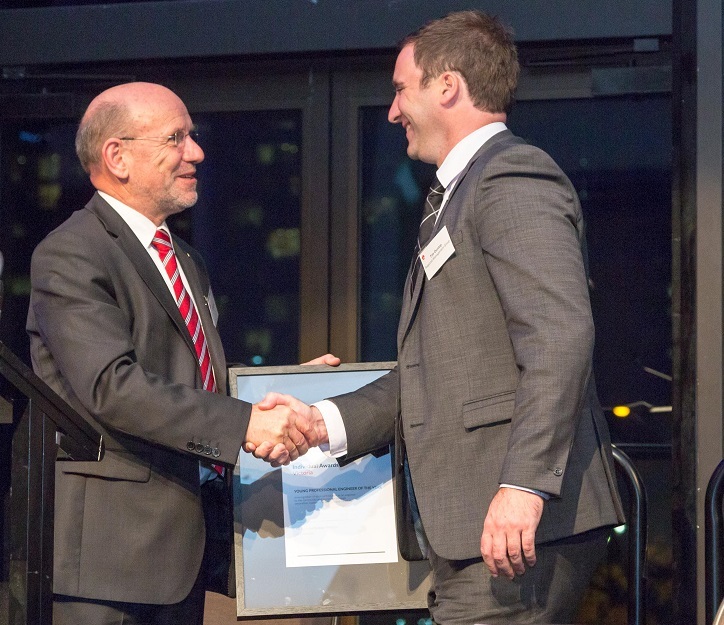 Tim was prompted to reflect on his career highlights this month when he was named Engineers Australia’s 2015 Young Victorian Professional Engineer of the Year. In the ten years since the freeway was complete Tim has worked on a number of significant projects throughout the Australasian region, like a $23 billion natural gas project in Queensland, and assisting the World Bank with a ring road in PNG. Since establishing back in Bendigo Tim has worked on several high-profile local projects. “We were involved in the Ulumbarra Theatre streetscape project,” he says. He says the project was a great example of how engineers can contribute to cultural spaces. “Maybe engineers in the past might not have done that, but now we’re seeing the transfer of engineering to being about bringing together the social, economic and technical aspects of a project,” he says. Tim can add social spaces to that list with his current project to help manage the Morely Johnson building development in Bendigo’s CBD. The high-profile four-story heritage building, which most recently housed Toy World, is being transformed into a training centre for disability support group Radius. “We’re bringing that building to life,” Tim says. Another project Tim is working on with big implications for the region is the Bendigo Airport Whole Water Cycle Management Project. “It’s the largest Whole Water Cycle Management Project of this scale north of the Great Dividing Range. This has some particular challenges as our water flows towards the vital Murray River, unlike water south of the range, which flows to the ocean,” he says. “This project itself is fantastic for what it will do for the airport area, but the real opportunity is being able to replicate it outside the airport into the whole of Bendigo. Tim says he would encourage anyone to pursue engineering, as the rewards far outweigh the challenges. For information on studying civil engineering from 2016 in Bendigo, visit our website.